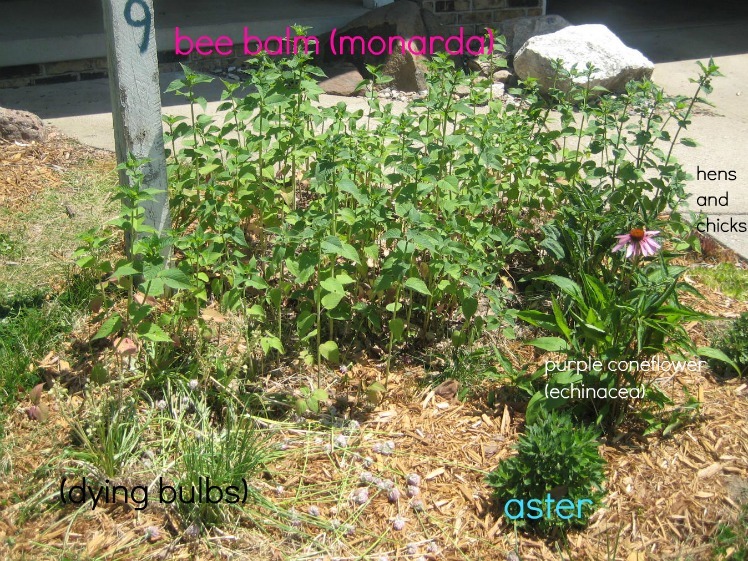 The monarda, or bee balm, came from my dad’s third wife, maybe 9 years ago as a small shovelful of stems. It spreads, but not rampantly, probably because of how I sited it. Insects love this flower! This patch will get taller and have dark pink flowers. I love the pepper smell from the leaves and their square stems. One plant lists for $13. You can barely see the hens and chicks that I have on the border. Because of their succulent nature, hens and chicks make nice edging near the pavement. I have purple and green varieties. These are 11 year old plants that survived a couple moves. Very easy to grow even when ignored. Mine haven’t spread the way they used to, and I’m attributing that to the heated conditions of the soil near the sidewalk. They were also $1; listed for $12. I used to buy bulbs every fall as a gift to myself. I haven’t done that for a couple years now. I am on the fence about bulbs because they seem to need more care than what I’d like to give. I enjoy seeing them all spring, so I won’t be tearing them out of the ground, but I’ll probably be ignoring them. The aster was a distressed plant for $1. $13 is what it might be worth now that it is 3 years old. My total: $3 (add another $8 for the bulbs) When you divide $3 by the 12 years I’ve lived here, that makes $0.25/year. I watered them only to get them established as babies. Really, truly, I don’t water them. Their value at the size they are now is about $44. What is growing in your garden? Frugal Tuesday Tip: Mardi Gras! This entry was posted in frugal family and tagged gardening. Bookmark the permalink. I totally agree. I bought itty bitty babies years ago from Bluestone Perennials, and now they’ve grown and been divided and divided again…Unfortunately, not only do *large* perennials cost a fortune (seems like $10-12 is the going rate, these days, for starters), I find they often do not survive the winter into their next year, for a few reasons: For one thing, they’re often root bound. Secondly, they just resent being transplanted at that age, and have gotten accustomed to being “coddled.” And, also, it’s VERY hard to muster the severity required to *cut back* all that lush, over-coddled growth and blooms—which you should, so a large plant can put energy into regrowing its roots–and thus they look pretty, but fail. Baby plants take a while, but they acclimate to their new surroundings better (or else they, too, die, but you’re out a lot less $$$ and grief) and usually there’s nothing tempting you not to prune.